Andrea Erickson's Zen show at mineral is striking. 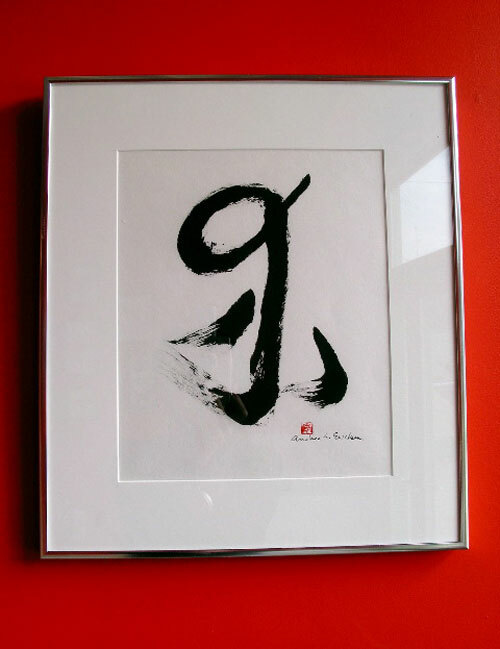 The bold expressiveness of Andrea's kanji (Japanese calligraphy) should appeal to modernists as well as followers of traditional sumi-e.
â€œZen painting springs out of a state of â€˜unconditioned unawarenessâ€™ and spontaneity, and the fluid energy in these paintings is remarkable,â€ explains owner Lisa Kinoshita. The show remains up through April 19. Kinoshitaâ€™s normal hours are noon to 5 p.m. Tuesday-Thursday and Saturday but sheâ€™s only open today this week so take a long break go get mineralized. Ask someone if they've ever seen an idiot magnet. When they say no, tell them you'll show them one and then just lead them around in circles until they get it. For your own safety, don't lead them into any rooms with sharp implements or baseball bats. There are two Elvis Presleys: Jailhouse Elvis and Vegas Elvis. Don't confuse them. Jailhouse Elvis sang purdy gospels for his mama. Vegas Elvis ate 14 cheeseburgers, washed them down with half a bottle of pain killers, and shot the crap out of a 21-inch Panasonic color TV with a .45 caliber pistol because he thought he saw Ringo waiting in the wings on the set of Merv Griffin. LINK: Flora vs Fauna and others in the clubs tonight. LINK: Letâ€™s eat at a bistro today. Fear or hatred of strangers, people from other countries, or of anything that is strange or foreign. USAGE EXAMPLE: Being the proud American that he is, Bobble Tiki is also a strict xenophobe. He simply doesnâ€™t trust foreigners. I heart Love Tacoma events. I heart Link N Drink nights. Therefore, I heart the Urban Pub Crawl on April 19. LOVE TACOMA PRESS RELEASE: Your Love Tacoma grassroots committee dares you to save the date of April 19 for a pub crawl unlike any other that you've ever seen or been on. We'll first convene at 4 p.m. at Alfred's CafÃ© and Bubble Room, 402 Puyallup Ave. After lively libations and conversations, our entire gang will hop on the LINK light rail for an urban pub crawl that will include a visit to watering holes at each stop along the LINK route. This Love Tacoma event is likely to attract at least 60 individuals who will create commerce at some of downtown Tacoma's finest locally-owned establishments. All of you lovers will be greeted with open arms at the following restaurants that we'll visit in this order: The Harmon, The Pacific Grill, Paddy Coyne's and Meconi's. Outside of this one-time Love Tacoma event, Link and Drink gatherings also occur at least three times a year in downtown Tacoma with 50-plus participants. The original Link and Drink began three years ago as a guerilla economic development movement coordinated by involved citizens and artists to bring life to the downtown core and promote the use of the LINK. For more information, visit Love Tacoma's Web Site, Love Tacoma's MySpace, or Roxanne Murphy of Creative Tacoma's e-mail. It's late Sunday night, and I have BanditoBetty and the KAke by my side. All we want is a really nice glass of wine. Not a regular restaurant pour of Columbia Crest, but a NICE glass of wine. That's all we want. Alas, the shortage of late night wine bars on a Tacoma Sunday night sends us to Doyle's Public House. I actually think Bandito suggested they might have some good wine. She was wrong about the wine, but what they do have is some great people and some great beer. So Doyle's it was. As I let the beer escape from my bladder in the Doyle's Public Restroom, I heed multiple texts from distant friends I have from around the country. I'm realizing how many wonderful people I know from all parts of this great American land. How do I know them all? No, I'm not a world traveler. No, I haven't really lived anywhere but Tacoma and Texas. And no, my multiple personalities all live with me here inside my head¬" not anywhere else. I know them through an Internet forum. Creepy, huh? Not really. I bet you more people have developed some level of friendship via the Internet than you can imagine. 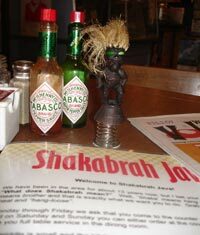 First, think locally: Have you become a fan of someone's blog, only to meet them out one night and mysteriously feel like you know them already? Maybe you already have a rapport through leaving comments to each other? Or how about learning of a social event via the Internet and showing up to find a new group of people you befriend. Face it, you somewhat met them through the Internet. OK, that one may be stretching it, but you can kind of see my point, right? Going even further than locally meeting people, I bet there are some of you out there who have an obsession, a hobby, or some sort of interest that has led you to a discussion forum. You visit the discussion forum somewhat frequently, make a post in a thread responding to a topic, then go back to the thread periodically to see if anyone has responded to your post. From there you start to see the same screen names, you read their posts and become familiar with their online persona. Eventually you begin to develop a respect for that person's input, or a dislike for who (or what) you think they might be. And let's face it, on an anonymous internet it's easy to make up a fake persona. Most people become braver when they are hiding behind their computer, don't they? Guess what? The Weekly Volcano World Headquarters has granted us here in our tiny corner of the Internet our very own discussion forum! In there I have created some rules and guidelines that most will find very informative when making contributions to any online forum. I'll show you how it works. Trust me. Now before you go off and poo-poo my friends I have established, saying they aren't my real friends because I know them through an Internet forum, let me tell you this: I've known these people for almost three years. I've met them all in person. I've met their families, their kids, their neighbors, and their parents. Mr. DeRosa, BanditoBetty and The KAke have even met them. I talk to them via phone on a regular basis. We visit each other many times throughout the year. None of us knew each other beforehand, yet we are all very close, and met because of an Internet forum. As a matter of fact, about 30 of them come to my house every Labor Day weekend. This year will be year number three. I do love Tacoma, but because of a World Wide Web I have a love for many people throughout the USA. (And Canada! Hi Noella!) See you in the forums! TACOMA DIARIES PRESS RELEASE: Tacoma Diaries somewhat proudly presents a new episode titled "Please Stay Frank Russell," a video film short that documents the recent efforts of one group of local citizens to convince the Frank Russell Company to remain in downtown Tacoma. Steve, Mike and Lisa take their efforts to the streets in hopes of reminding this world player in the financial biz the grass is not always greener on the other....... OK, maybe occasionally it is but not this time. The new episode will screen on Comcast Cable April 4 at 5:30 p.m. and April 5 at 9 p.m. on Channels 29/76. It will also be available to view online here Friday. Tomorrowâ€™s the day. Tacomaâ€™s first comprehensive noise ordinance will finally make its debut. After a vote in February by the Tacoma City Council approved the comprehensive noise ordinance, a date of April 2 was set for its implementation. Since then, the City of Tacoma and TPD have been doing their best to warn those that the noise ordinance will most affect (primarily live music venues) of what they can expect come April 2. Tomorrow the warnings stop and the real fun begins. Beginning April 2, 2008, a new, comprehensive noise ordinance will go into in effect for Tacoma. The noise ordinance was created to help regulate the noise levels that exceed the recommended day and night time levels that are considered disruptive to the health and welfare of the community. The general prohibitions limit night time noise from any source to be no more than five decibels above the background noise levels and day time noise is limited to no more than ten decibels above background noise levels. Sound levels associated with commercial music cannot be more than six decibels above background noise levels as measured within a dwelling. In addition, commercial music cannot be plainly audible from a distance of 100 feet or more. The ordinance limits construction hours from 7 a.m. to 9 p.m. on weekdays, and from 9 a.m. to 9 p.m. on weekends and federal holidays. Music from instruments, stereos, or car stereos that is plainly audible 50 feet from the source, or within any dwelling unit that is not the source of the sound, is prohibited. Frequent, repetitive or continuous sounds such as horn honking (except for emergency purposes) or revving engines is also prohibited. Check out the Weekly Volcano on April 10 for a comprehensive look at what the noise ordinance will really mean for Tacoma. Until then, be very, very quite â€" starting tomorrow. The act of picking up a guitar and making some noise becomes a life-changing experience in Girls Rock!, an irresistible new documentary from filmmakers Arne Johnson and Shane King that showcases the transformative power of rock â€˜nâ€™ roll. The filmâ€™s subject is the Rock â€˜nâ€™ Roll School for Girls; every girl between the ages of 8 and 18 should be required to check it out. The weeklong summer sessions, which began in Portland, Ore., and now are offered nationwide, give girls the chance to learn an instrument, form a band, write a song and perform before an audience. A mandoline is a French kitchen tool used for cutting vegetables ultra-thin. A mandolin is a musical instrument, prominent in bluegrass, which looks like a mini-guitar. Got it? If you need a demonstration of the latter, I suggest catching Montana Slim at Jazzbones tonight. Montana Slim from San Francisco positions a mandolin between dueling melodic fiddles, an acoustic guitar improvising with a solid bass line with firm roots in newgrass. LINK: Left Alive and others in the clubs tonight. LINK: Movies on local screens. LINK: Letâ€™s drink wine tonight. USAGE EXAMPLE: Out of nowhere, Bobble Tiki appeared to solve the empty keg problem like a dues ex machina.